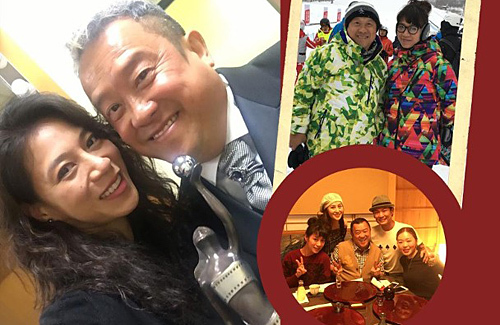 While many people were celebrating with family and friends on Christmas Day, Eric Tsang (曾志偉) was involved in a car accident while vacationing in Hokkaido, Japan. Fortunately, Eric did not sustain much injuries and is doing well. According to reports, a seven-seater vehicle collided head-on with Eric’s car. The local Japanese police arrived at the scene and conducted an alcohol test. At the time of the accident, Eric was also travelling with make-up artist, Vanus Li, and a Hong Kong Police Director of Crime and Security, Li Zhiheng (李志恒). Li Zhiheng underwent a surgery for neck injuries. As Eric could not be immediately reached, Eric’s daughter Bowie Tsang (曾寶儀) confirmed through her manager that the accident was not too serious and everyone is safe. In fact, Vanus posted on Instagram of a picture of a window overlooking the snow with following caption, “Beautiful Boxing Day. All the Best #thankfulus #cherish #grateful #unforgettable. Vanus later deleted her post. Well her father is well. It was “Hong Kong Police Director of Crime and Security, Li Zhiheng (李志恒). Li Zhiheng underwent a surgery for neck injuries” who had the neck injuries. Evil Eric should not have such luck as to escape injuries. Probably bribing police with a holiday trip and doing more sinful deeds with female travelling company. Otherwise why would thhe daughter need to delete her post so urgently? @kmuk He is definitely a man that escapes his evil deeds for many years, time and time again. I dont wish death on him but I hope his evil deeds will expose him ……. Hope karma catch up with him for what he did to Yammie Lam. Hear, hear his time will come hopefully sooner than later.